Album Info: Pictures of CSX operations and equipment around Baltimore, MD. Description: Capital Sub overpass over US 1 in Elkridge. If you look close, you can make out "BALTIMORE & OHIO"
Description: CSXT 4814 leads trash empties through Relay. Description: New F350 Super Duty hi-rail truck. Description: CSXT 265 leads a westbound through Halethorpe. Description: Cab side picture of the first SD50-3 I have seen. Description: Never thought I would see the day when a GP40-2 leading a merchandise train on this line would be noteworthy! Noteworthy enough to photograph in spite of the crummy weather. Description: Going away shot of Q43914 westbound at St. Denis. Description: Pan shot of CSXT 132 leading a westbound hopper train through St. Denis. Description: Juice train crossing Thomas Viaduct. 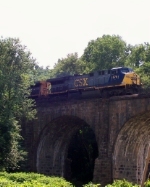 This picture will be on CSXT's 2011 calendar! 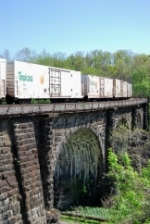 Description: Tropicana reefers crossing Thomas Viaduct. Note the rare Tropicana lettered reefer with a CSXT road number. Description: CSXT 7348 leads a westbound through St. Denis early in the morning. Description: CSXT 5435 leads Q41113 past engine 53 on an auto rack train. Description: CSXT 390 leads Q41125 through "downtown" Relay on the Old Main Line. The double track Capital Sub is in the background. Description: Thomas Viaduct celebrates its 175th anniversary July 4th. AC6000 676, far larger and more powerful than the viaduct's designers and builders could ever imagine, leads Q70227 across. Description: Out of storage, Diversity in Motion engine 699 leads CW60AC 669 on Q41025 at St. Denis. Description: Freshly painted covered hopper 254853 has so far escaped the taggers. Description: A young deer took advantage of the quiet railroad to cross the tracks about 100 yards from me. Description: Trash cars on Q40509 added their own scent to the ambience at Relay. Description: Anybody heard which engines the new MP36's will displace? Description: Dirty 855 leads Q41007, with the Stealth Dash-8 as second unit, through Relay in fading light. Description: The most photographed CSX Dash-8 visits Relay on Q41007. The train was running Restricted Speed which gave me a good look.